Make sure you know exactly what you want before you buy one of our actions from BAT Machine, one of the best rifle actions makers. Bullet Central has put together a helpful guide that are especially relevant in helping you learn about the different types of BAT actions and feature options. 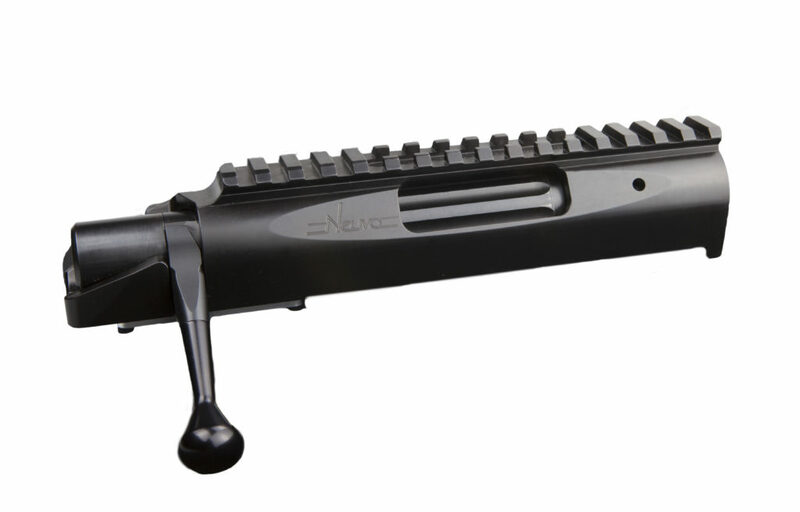 The Neuvo M is a longer version of the original Neuvo, but with a flat bottom and has a 20 MOA Picatinny Rail. The Neuvo BAT action is state-of-the-art in terms of accuracy with improved safety features that is ready for competition out of the box. Dwight Scott & Bruce Thom are the minds behind the Neuvo action. The Neuvo action incorporates all the best ideas Dwight has seen in 35 years of building the most accurate rifles on earth. With Dwight’s concepts, a manufacturing company was needed, and BAT Machine was at the top of the list, headed by Bruce Thom. The New TR Bat Action is identical to the VR action with some improvements for tactical shooting; A new extractor and ejector port for fast shooting, a new body design for increased stiffness, a new bolt design that increases reliability in dirty conditions, and a trigger hanger for tunable pin fall. This action is compatible with AI double stack magazines. 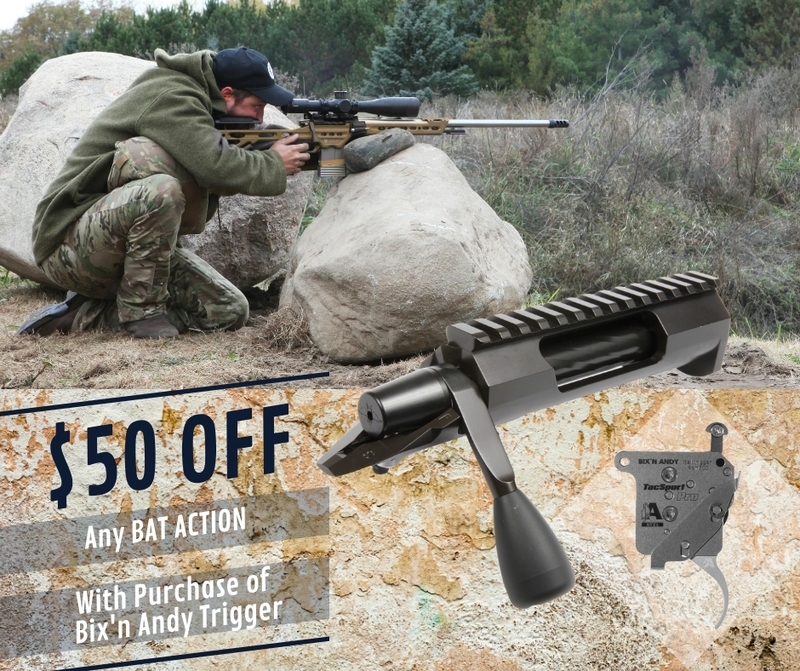 These BAT rifle actions are one of the most versatile actions BAT machine makes. It’s great for larger standard varmint cases. One of the most popular models for short range is the BAT Machine Model B because it also works well for the 6BR, 6Dasher and 6.5/47 cases, it makes a great action for cases based on 22-250 and up to 6mm Remington. This is the best choice for rifles from 10 to 16 lbs shot off a rest that are not carried a great deal. This model is a variation of the B model BAT actions, it has the same bolt and port length as a B action but the end of the action is longer and therefore gives you additional space to bond it with the stock. 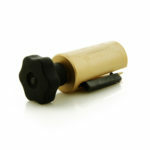 It has a integral sleeve that goes over .935″ of a barrel, and as a result giving you surface for bedding it on a rifle. The MB action is 8.500″ long, it has several exterior shape options, has a starting weight is 38.5 oz and can vary depending on features chosen. 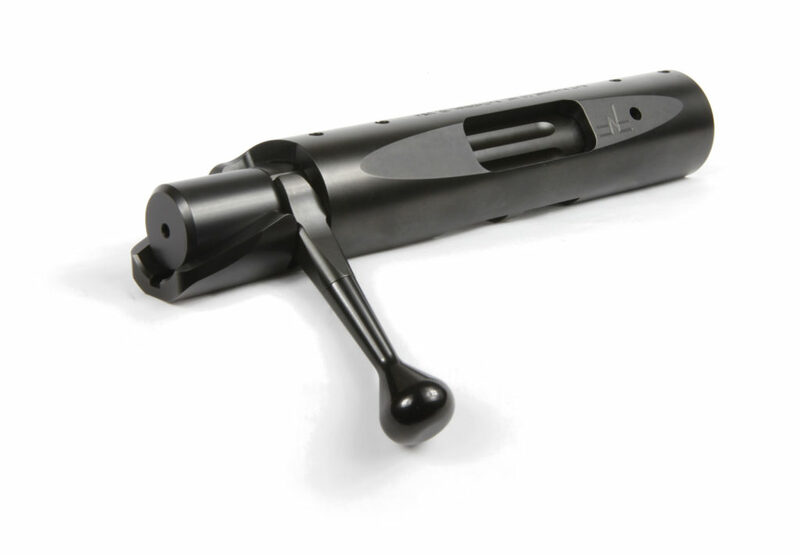 The load port length is 3.00″ and the barrel tenon is 1.062×18 tip and has a maximum barrel is 1.25″ and a maximum shoulder contact of 1.23″. The DS BAT actions are also a popular action for short range because it is a benchrest specific action that handles PPC and BR cases. 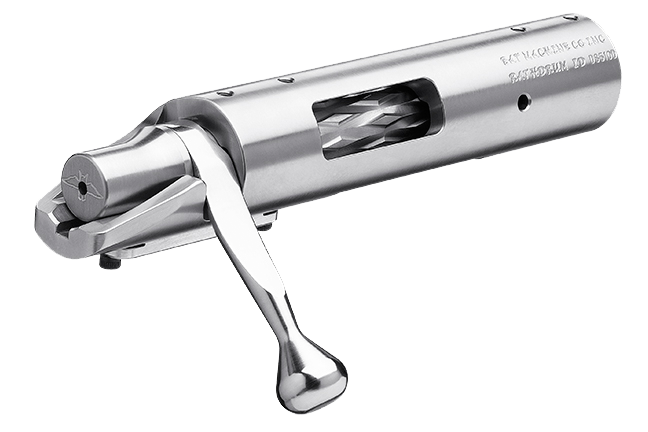 This action was designed based on the Model B action and includes an adjustable trigger hanger, a roller cocking piece and a dual port setup. 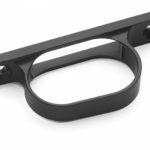 The load port is designed specifically for short case lengths to allow for faster and smoother bolt cycling. The action is 7.565″ long and only comes as a 1.35 round, the weight of the DS is 32.5 oz but can vary depending on features chosen and the load port length is 2.80″ long and the barrel tenon is 1.062×18 tpi. The 3 Lug action, or 3L, can be used for short range and benchrest shooting because it can handle 223 to 308 cases. The 3L is the smallest of BAT’s 3 lug actions and is comparable to the Model B and Model DS BAT actions in size, but the 3 lug bolt throw is only 60 degrees, while the bolt throw on a 2 lug action like the B and DS is 90 degrees. The bolt body on a 3 lug also covers the lug area and reduces the chance of a shooter getting blow by in the face. 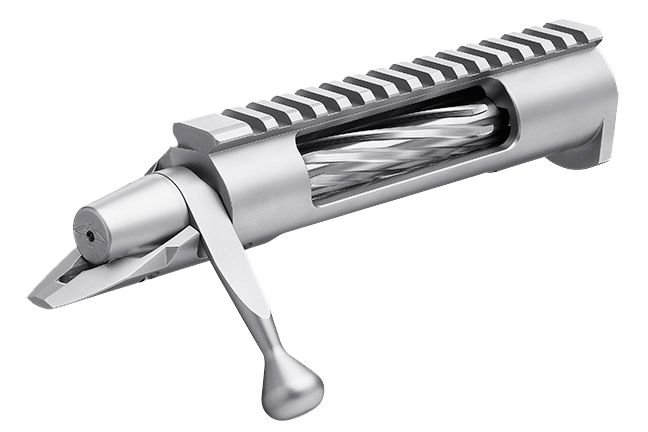 This action is 7.43″ long and comes in several body shapes with a starting weight of 33 ounces, a load port length of 2.70″, and the barrel tenon is 1.062×18 tpi. The VR is a Remington 700 short action and is excellent for tactical shooting or hunting that is 8.00″ long and 1.35″ in diameter. The average weight is 33.4 oz. 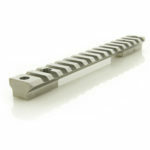 with an integral rail, but varies with the options chosen. Typically this is a repeater action, but it can be ordered as a single shot. 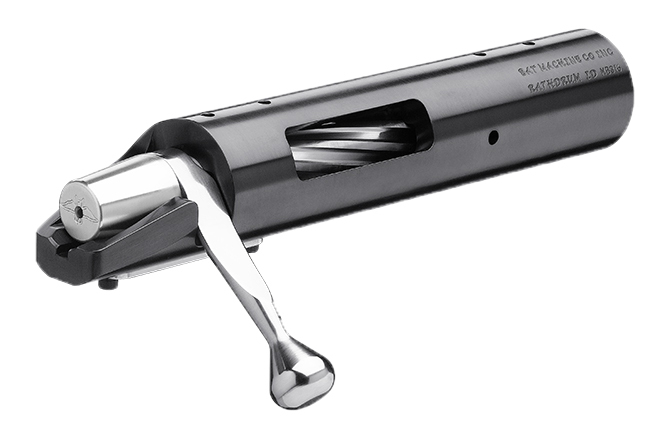 The load port can be cut for almost any Remington 700 short action and the ejector port length is 2.55″ while the barrel tenon is 1.062x18tpi. The Model M BAT actions are well-suited to many calibers used in F Class and benchrest competition and is great for those wanting to shoot around 1,000 yards or further by using bigger cases. The M can handle big cases up to a .338 Lapua used by long range hunters shooting off a rest that do not need a fast followup shot. It can also work well all the way down to the 243 Winchester, it is .935″ longer than the Model B to allow for the larger cartridges and more bedding surface. 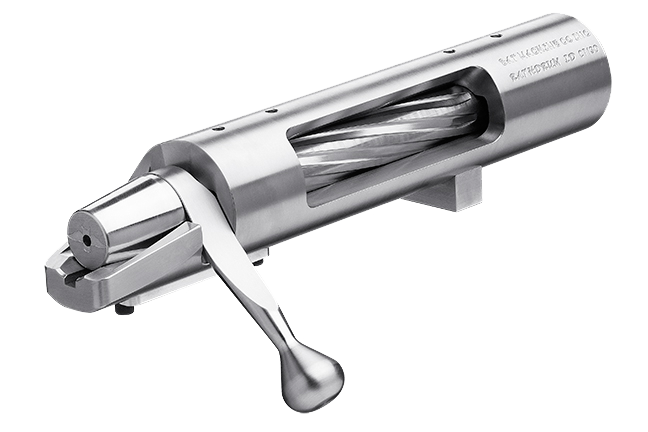 The starting weight for this action is 48 ounces and requires a 1.25″ diameter barrel. These BAT actions are typically used for tactical shooting or hunting as it is typically a repeater, but can be ordered as a single shot. The HR is a Remington 700 long action that will fit most stocks with either none or very minor inletting changes. 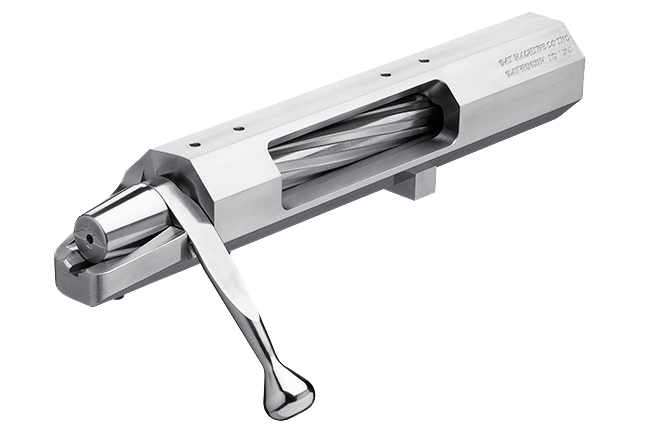 The action is 8.860″ long and 1.35″ in diameter and the average weight, with a integral picatinny rail, is 36.4 ounces, the load port on this action can be cut for almost any Remington 700 long action, including the extended Wyatt boxes. 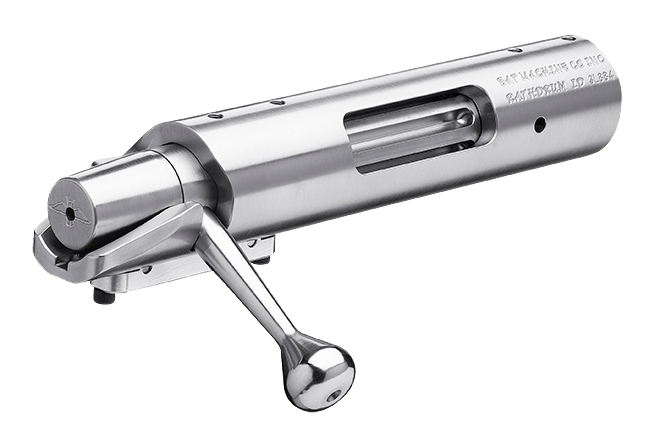 The ejector port is 3.52″ in length and the barrel tenon is 1.125×16 tpi. The CT BAT actions are the same size as the Model M, but has a larger barrel tenon. This allows for usage of the CheyTac case and is 8.500″ long, the load port length is 3.35″ and the barrel tenon is 1.187×16 tpi. 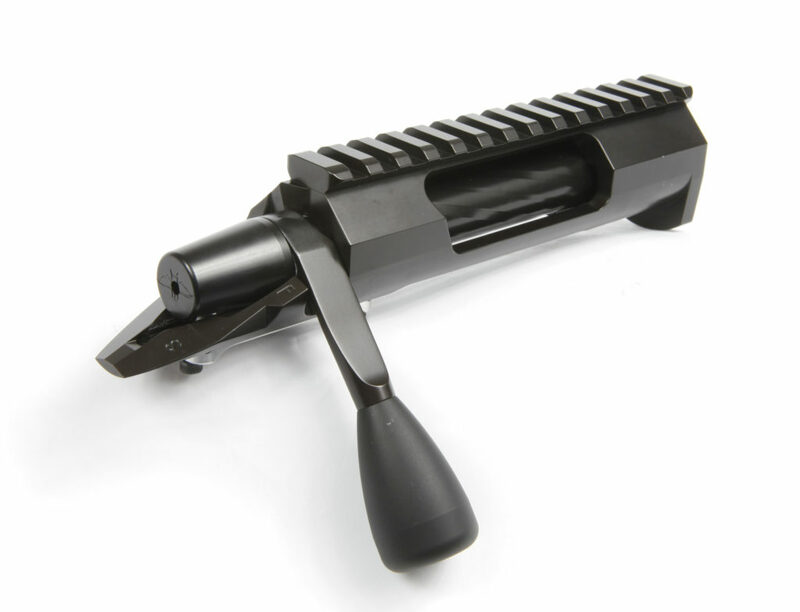 This action can be 1.550 diameter or 1.470 octagon with an integral 20 moa picatinny rail. The 3LL action is the largest 3 lug action BAT machine makes, it is comparable to the 2 lug model M in size and will only work on cases up to the Magnum size. The advantage of a 3 lug action is the bolt throw is only 60 degrees rather than 90 degrees. This reduces the chance of blow by getting in the shooters face. 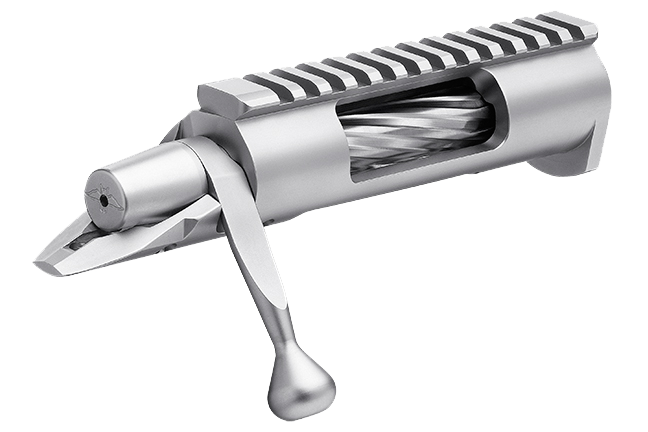 The 3LL action is 8.43″ long and can be ordered in several body shapes, the starting weight is 38.5 ounces, the load port length is 3.325″ and the barrel tenon is 1.062 x 18 tpi. The Model L BAT actions are longer than the M and CT actions and also has a larger barrel tenon. The L action is 10.00″ long with several shape options with a starting weight of 80 ounces but can vary depending on features chosen. 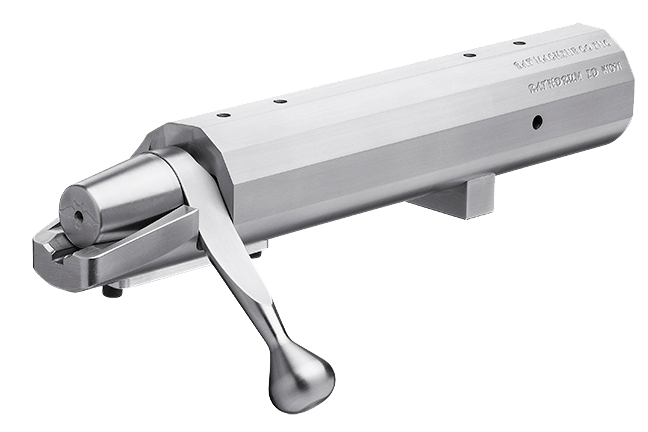 The load port length is 3.80″ and barrel tenon is 1.25 x 16 tpi, it requires a 1.45 inch diameter barrel. For more information click here. Due to feedback at SHOT Show, BAT has decided to make a shorter and lighter version of the EX action to help with the new weight restrictions on some ELR shooting matches. The EX BAT actions are the largest offered by BAT Machine. 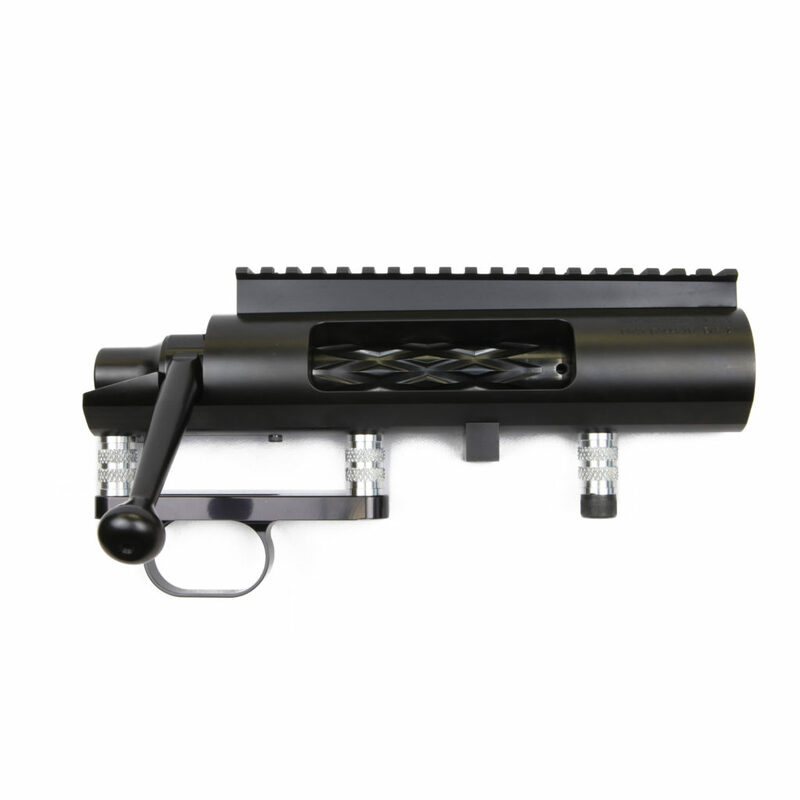 It is designed to work with 50 BMG cartridges with a starting weight of 128 ounces. 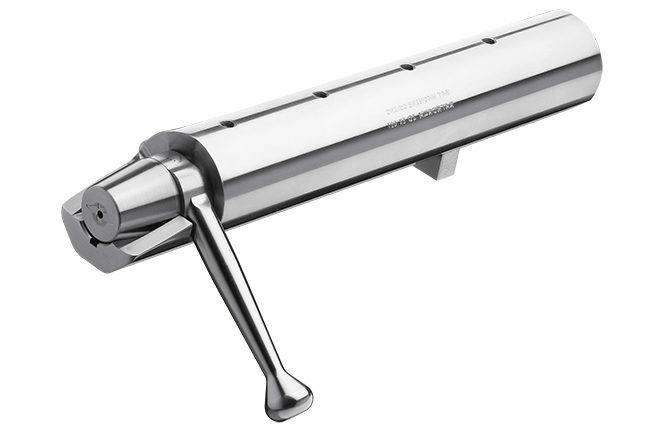 The action is 12.00″ long and has two exterior shape options, a load port length of 5.50″and the barrel tenon is 1.5 x 16 tpi, it requires a 1.75 inch diameter barrel. For more information click here.